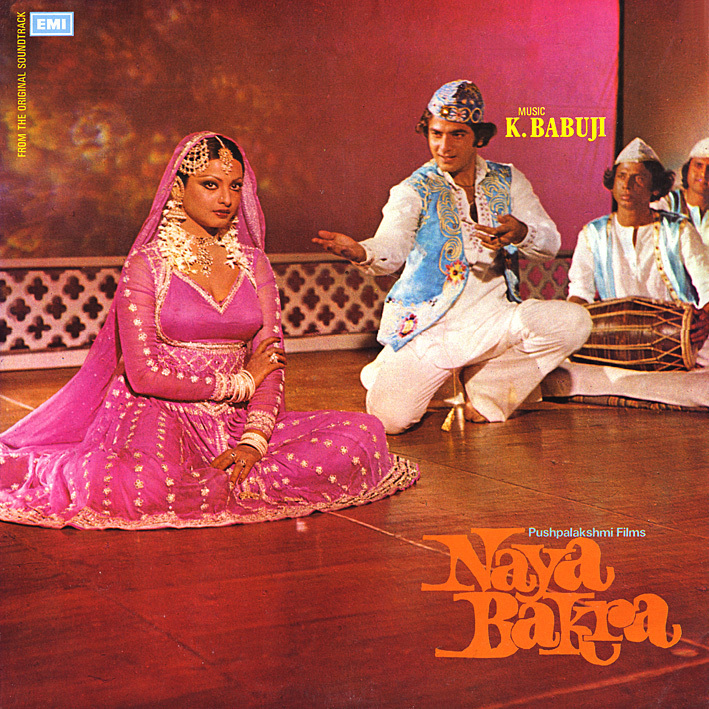 'Naya Bakra' is kind of an odd soundtrack. On my first, cursory listen it didn't seem like much; nothing out of the ordinary. But then I began to notice things... moog stabs and other electronic effects unexpectedly popping up ('Rekha Tujhe Dekha', 'Naya Bakra'), certain melodies getting stuck in my head ('Aap Se Dil Mila', 'Nayi Nayi Jawani'), a discernible RD Burman influence ('Sajna Bin Tere'), and the album suddenly sounded a lot more interesting. I wanted to play it again, which is always a good sign. No doubt a rare album and I have no hesitation to except that I don't know about MD K. Babuji, never heard about him whether he had scored more albums or not, but song 'Rekha tujhe Dekha' a qawaali song was used to be telecast on Doordarshan's program 'Chitrhaar' in 80s. yes the music is of course good..just completed hearing it ..Aaap se dil mila sounded really good..i dont know why but in this album i am getting a feel of south Indian touch in music. will request you to upload all sides of vinyl cover..that gives idea of lyricist as well.. There's no pleasing some people I suppose.